Rimadyl There are 3 products. 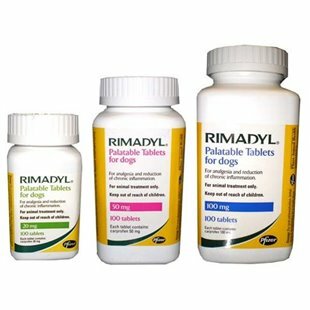 Rimadyl tablets (or carprofen) is a POM-V category medicine that can be prescribed by your vet for the treatment of painful, inflammatory conditions such as arthritis or soft tissue injuries. Rimadyl is most widely available in tablet form that is usually very palatable. Other formulations include a liquid for injection.What is Osteoarthritis? - Osteoarthritis is a painful condition that can affect an animal's joints. Osteoarthritis is often seen in older animals due to the aging process, although some younger pets may develop this condition as a consequence of other illnesses such as hip dysplasia or cruciate disease in dogs. Arthritic pain is also becoming increasingly diagnosed in cats, as we are progressively more able to identify symptoms of pain in this species. Rimadyl is not normally prescribed for use in cats.How does Rimadyl work? - Rimadyl is a non-steroidal anti-inflammatory drug (NSAID). This drug works by inhibiting an enzyme known as cyclooxygenase (particularly cyclooxygenase-2) that is responsible for prostaglandin synthesis. Because osteoarthritis is an inflammatory condition, Rimadyl and other NSAIDs are highly effective at controlling this form of pain and often bring much needed relief to a stiff and sore animal. Many owners report that their pet has a 'new lease of life' following NSAID therapy.Are there any side effects or special precautions? - There are a number of precautions that your vet will have considered before prescribing RimadylIn common with other NSAIDs, Rimadyl, if used incorrectly can have an effect upon the kidneys, liver and gastrointestinal tract which is the reason that Rimadyl must only be administered to your pet in accordance with veterinary advice and with a valid prescription.If, while being treated with Rimadyl or other NSAIDs, your pet becomes anorexic, depressed, starts vomiting and/or has diarrhoea, you should speak to your vet immediately before giving additional doses.